Great story but getting lost isnt for everyone. I try to get lost on purpose however being lost scares the heck out of my wife. Great story.. sometime wandering off and getting lost can discover something just like you di. I love the color of the shot! The “funny” part is that we didn’t take the train! We walked to Mongolia! Yeah, let’s say that you need to get down where the guide tells you to, if you are on a tour, otherwise be careful and come back exactly via the same path you went up. If you come to Shanghai let me know! agree 100% — off the road. Lost. Something moderately screwed up — those are the best stories. Oh, and your photo: so full of color!! Hi Shannon, what a beautiful – and delicious – picture! I don’t get lost that often but I like to wander around an area without a real plan. It’s true that sometimes the best moments are accidents, like finding the stray cats in the Botanical Garden in Buenos Aires. Sometimes I just watch people for a couple hours. Haha, all my stories are getting lost stories. I have no sense of direction. Really, I should never even be allowed to leave my own backyard. I absolutely love the photo with this post, btw. I love getting lost when travelling! Stumbling upon local, authentic cultural experiences like these really does it for me. Great story. I do love a good getting lost story too :-) That fruit looks amazing! I agree 100% with Jason, he took the words out of my mouth! What gorgeous offerings!!! Wow! First of all, what a stunning fruit basket. I totally agree with you – getting lost can be a very good thing, and at minimum, always builds a good travel story! I think that you had a much better time at this temple then you ever would at Gunung Kawi. What a wonderful experience. 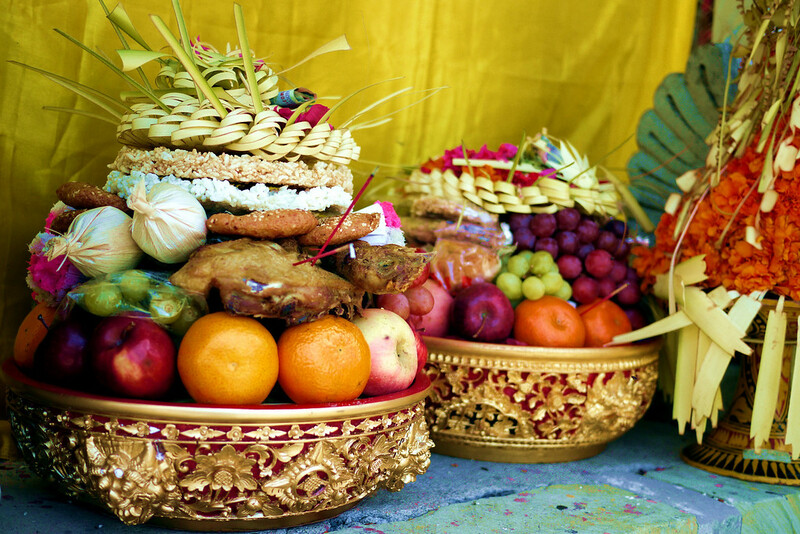 I do love Bali and the rituals that happen every day. Their offerings are a work of art. Shannon, I totally believe it’s moments such as these that bless us with some of our most fondest memories of our travels. Your out strolling about, looking for a place and excited to find it. All of a sudden you get lost, or are given bad directions, then Bingo! You walk into something that you were not expecting or had no idea existed. Sometimes, when I arrive somewhere new, I just love to hit the streets, on explore by bicycle or public transport. Not having any real idea on where I’m going or what I’m looking for. I always seem to find something that interests me. Love the image of the fruit offerings. Makes me hungry…..